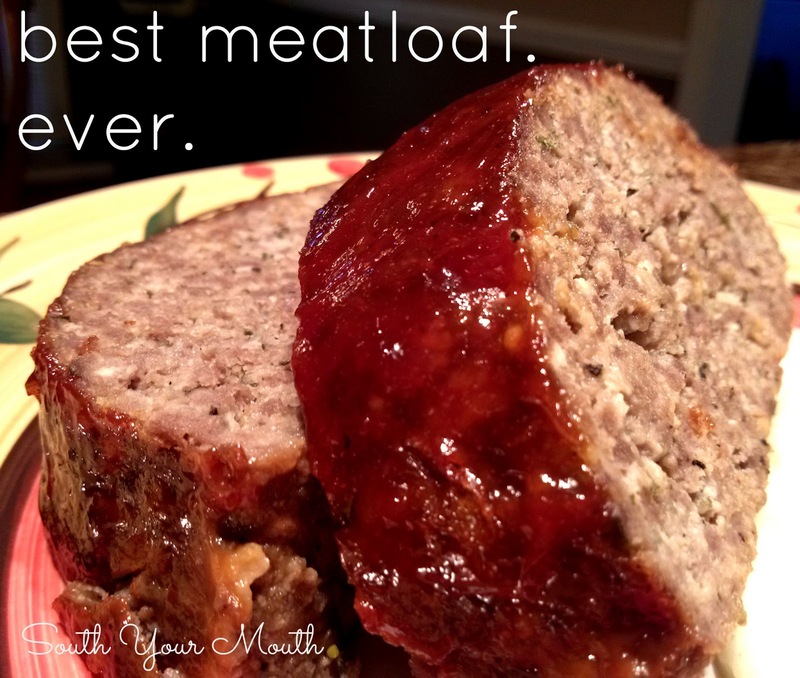 South Your Mouth: Best Meatloaf. Ever. I hated meatloaf growing up. And since I hated it growing up, I never ate again. Just kidding. I didn't hate meatloaf. I just thought I did. I hated meatloaf night. Not meatloaf. What I hated was peas. Those little round peas in the silver can. We called them 'sugar peas' but google is telling me they're called 'early peas'. Whatever they are, I hated them. And I still do. But each time my mama served meatloaf, we had mashed potatoes and those horrible, wretched, squishy, murky, God-awful peas. So my 6-year old brain made the connection and decided I didn't like meatloaf. Once I figured out I didn't hate meatloaf I started eating it again. I ate some I liked and some I didn't. I started asking questions and paying attention to how folks made it and decided to try it out. Since I like my meatball recipe so much, I started with it as a base. And, oh my blog! I'm telling you, this makes the best meatloaf! Ever! Sometimes I make it with onion only and sometimes I add spinach, peppers and/or carrots but as for the base recipe? This is spot on! I like a meatloaf that will slice (not crumble) because when I learned that I actually did like meatloaf, I also learned that I really like meatloaf sandwiches. I like to heat a little oil in a skillet and pan-fry thick slices until they've got a little "crust" to them then dress those bad boys like burgers. Combine eggs, salt, pepper, garlic powder, Italian seasoning, parsley, worcestershire, onion and other veggies to a large bowl and mix well. Crumble ground beef into bowl on top of egg mixture. Add parmesan and bread crumbs and gently combine all ingredients with hands, taking care not to over-work the meat (don't "squeeze" it through your fingers). Spray a baking pan with cooking spray. Gather mixture into your hands and shape into a loaf (as best you can). Place loaf into pan and finish shaping, patting it until it is uniform in size. Bake at 425 for 15 minutes (to sear) then reduce heat to 350 degrees and continue cooking for one hour. Combine ketchup and barbeque sauce. 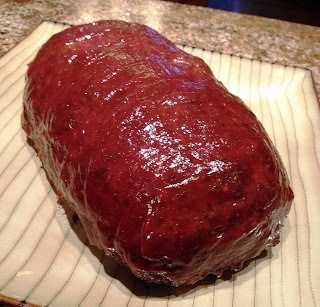 Baste meatloaf with ketchup mixture then cook for an additional 10 minutes. Remove meatloaf from oven, cover loosely with aluminum foil and let rest for 15 minutes before serving. *Grate (or process in a food processor) whichever vegetables you like and add up to 1 cup to the meatloaf. I've added spinach, carrots, red and green peppers over the years. I hate peas too!! Maybe that is why I don't eat meatloaf...LOL. I will have to try this one out soon!! I just had to let you know---YOU ROCK!!! I love your blog and your recipes. Thanks. Just got done looking through your recipes. Yep, keepers there. Oh lawwww! What an amazeballs things to read! Thank you and I'm glad you found your way here! Love your blog, very nice! This recipe looks fantastic. Cannot wait to try it. Stop by and visit us. We are having a terrific giveaway from a Southern author this week. Register in the Televenge post! I'm making this tonight! Since I absolutely LOVE your pork recipe, I'm sure we'll love this too! I'll be sure to let you know how it turns out for me! Thanks!!!! We are having this for dinner tonight.... It hasn't even gone in the oven yet and I want to eat it! It smells delicious!!!! My husband is weird about meatloaf... meaning he only has one recipe that he will eat and it's his moms. It is a really good one, but I want some variety! I'm hoping this one is what we are looking for which I'm pretty sure it will be! Thank you for your AWESOME recipes! I hope you liked it! In my experience though, NOTHING'S as good as the mother-in-law's. Grrr. Have you tried this with ground turkey as well by chance? I haven't, but I'm sure it would be great! I love meatloaf but I don't love trying to drain the fat off as it cooks.....I notice your recipe doesn't drain the fat off.....what do you do with it? How do you handle that? There's certainly a fair amount that cooks out but I always bake this in a 13x9 pan which is big enough that the meatloaf isn't "swimming" in grease when it's done. I lift it up and out of the pan using two spatulas when I'm ready to serve. I've always used a broiler pan and life the meat off with a huge spatula that I also use for quesadillas. Made this tonight and it's amazing, not a big fan of meatloaf either but i loved this one. Only adjustment i made was putting about a cup to a cup in a half of Colby jack cheese in between layers of meat. Just found out my future son in law (he's a yankee bless his heart) LOVES meatloaf so this is going on the table tonight! This is in the oven as we speak. The recipe sounds great and your pictures look delish! Cannot wait to try it! Just finished eating it and my husband said 'THIS IS SUCH GOOD MEATLOAF' about 3 times in the first 5 minutes of eating. We both loved it! Will definately make it again. Thanks. YAY!!! That's awesome to hear! Thanks for taking the time to let me know! I grew up loving meatloaf, because my Mom and Grandma made awesome meatloaf! When I make it at home, my husband and my son get excited! Your recipe is almost identical to mine...I wish meatloaf haters would give it a chance....it is so wonderful. Not all meatloaves are created equal, that is for sure! I'm baking your meatloaf right now. Smells great! My husband is going to have meatloaf sandwiches in his lunch tonight. He works midnights. He stopped at the store to get the ground beef and sausage for me this morning :) Thank you! this recipe is amazing and we aren't huge fans of meatloaf until now! Ha Ha Ha, This almost reads like a meat ball recipe.It reminds me of when my son was little he hated meatloaf so I started making them in balls and called them meatballs. He loved them. Found you through Southernplate.com and love reading through your recipes. I'm looking for some new things to add to my repertoire. Yours is maybe the first meatloaf recipe I've seen that uses parmesan cheese, except for mine. Love your recipes but I COMPLETELY love your blog!! You are hilarious! This was very very Delicious. I followed the instructions nearly to the letter. I only had grated parmesan in the container, so I sprinkled a decent amount. I also included some bagged carrots I had to get rid of; as well as some frozen mixed green, red, and yellow peppers I let thaw before using. Extra onions and I used Sweet Baby Ray's Honey Barbecue sauce, chopped to minced garlic. I served it to guests for dinner and they said " This is the best f-1ng thing i've ever put in my mouth " and "That was really good meatloaf. " I don't foresee getting lost in meatloaf recipes anytime remotely soon. Thank you. I've made this a few times and it is very good, I was just wondering if I was to add other vegetables is it 1 cup in addition to the onion or is it supposed to be 1 cup total? I made this a few weeks ago and within minutes it was devored!! Thank you for making me a wonderful cook!! Yum! My husband and son love meatloaf and the rest of the house had lukewarm feelings about it...UNTIL this recipe was given a try! Now they’re telling me to put it into the regular rotation of things. I had green pepper. The Worcestershire, herbs and cooking time really set this one apart from other meat loaf recipes and it was darn good! Thank you! !